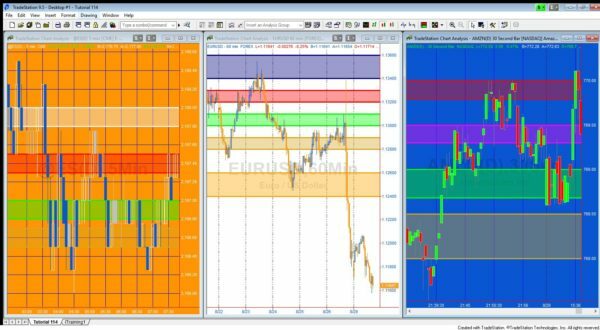 Tutorial 114 demonstrates how to use the rectangular drawing tool to draw colored zones on a chart. The tutorial demonstrates how easy it is to draw and style rectangles using TradeStation 9.5 drawing objects. The tutorial is in response to a customer request. The tutorial program use BN points to set the start and end points of the rectangles. The rectangle class is used together with several of its properties and the create class. The tutorial uses a method to create the rectangles, which is called from several places in the program. Tutorial 114 can create 5 rectangles. The tutorial has been kept intentionally simple. The program is available for download for a small cost or for FREE to Gold Pass members. This tutorial uses the ExtRight property of the Rectangle class. This only became available in release 14 of TradeStation 9.5. In the video, I describe a workaround if ExtRight is not available. Tutorial 114 is available for IMMEDIATE download for $9.95 by clicking the ‘add to cart’ button. After download the programs can be opened, you will be able to see the program code and modify it if you wish. After purchase you will be redirected to a download page, so don’t close the browser. The download ELD includes _Tutorial 114 an EasyLanguage show me study. Tutorial 114 was developed for TradeStation 9.5 update 15 and will not work with MultiCharts.